Kitchen-sink realism among bottom-dogs in Louisiana gives the first half of Hill’s second novel (Satisfied with Nothin—, 1996) an absorbing artistry. Hill gets off to a seemingly amateurish start of high melodrama that swiftly morphs into a hook that locks your eyes to the page. Ten-year-old Little Man was inadvertently seduced into taking crack by the sister of drug dealer Kojak, who now has Little Man bound to a chair and will kill him unless Little Man’s brother, D—Ray Reid, 15, comes up with a hundred bucks to pay for Little Man’s crack. D—Ray steals his mother’s pistol, then a truck, and drives to a grocery store outside the black community, where he kills Stanley, the clerk. D—Ray feels the law closing in on him; he has a record, and his fingerprints are on the truck and in the grocery store. But before he goes into hiding, we—re treated to two choruses, one conducted in a barbershop as the customers await their haircuts (race relations are discussed at great length) and the other among three women in the Reid living room (where we learn that D—Ray’s father is in prison for life, having killed a white man). The lad-on-the-run theme speeds along nicely, neatly handled. When he’s captured and put on trial for killing Stanley, D—Ray comes up with some fanciful alibis but is nonetheless convicted of Murder One and put away. During his six years as a prisoner, D—Ray is visited regularly by Stanley’s father, Mr. Henry Earl, who wants D—Ray to reform and take his dead son’s place in the family. 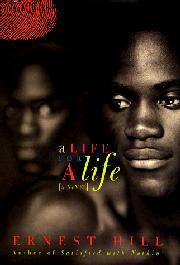 The sentimental ending aside, Hills’s swift simplicity in the telling and his rich black dialogue will carry you along.